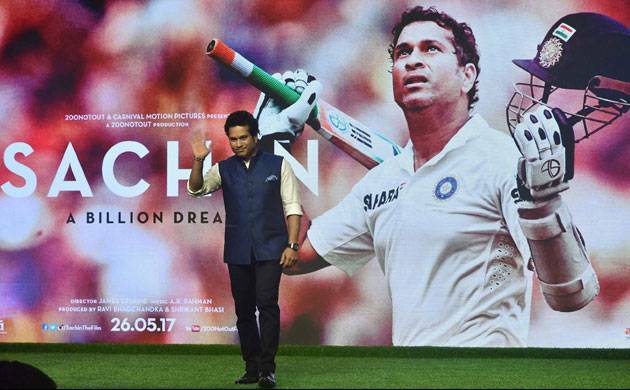 Pakistan Films Exhibitors Association on Thursday said that film exhibitors in the country are keen to screen Master Blaster Sachin Tendulkar’s upcoming biopic “Sachin: A Billion Dreams” if the film is cleared by the censor board. He said theaters in Pakistan are banking a lot on Indian movies. “So far whichever movie from India has been screened here, it did good business,” he added. Directed by James Erskine, “Sachin: A Billion Dreams”, traces Sachin’s journey from a young boy to a cricketing legend. The film’s distributor Anil Thadani said the movie will not release in Pakistan as of now because there has been no inquiry regarding the same. “No it is not (releasing in Pakistan). They (distributors) usually approach us and take the film from us to show it in Pakistan. But we haven’t got an inquiry from them so far,” Thadani told PTI. However, Thadani declined to comment when asked if the decision to not release “Sachin” in Pakistan is because of the political tension between the two countries. “If it doesn’t release (in Pakistan) then one loses out (business) but someone needs to pick it up, the terms needs to match,” he further added. Before its release on Friday (May 26), the cricket fraternity and Bollywood stars attended the screening of the film on Wednesday.